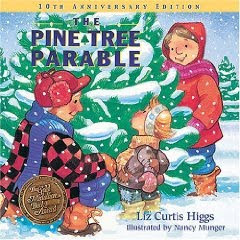 For the letter P we read the book The Pine Tree Parable . This is such a cute book with such a wonderful message. It is a story of giving and showing kindness and love to everyone no matter what. It is such a joy to share with my littles. After we read our story we made little pine trees out of craft foam and sang some Christmas songs from a Mickey Mouse sing-along-book.